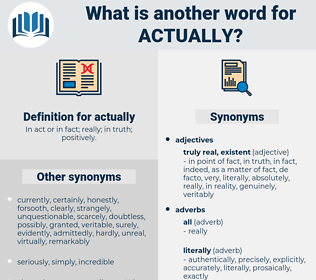 What is another word for actually? 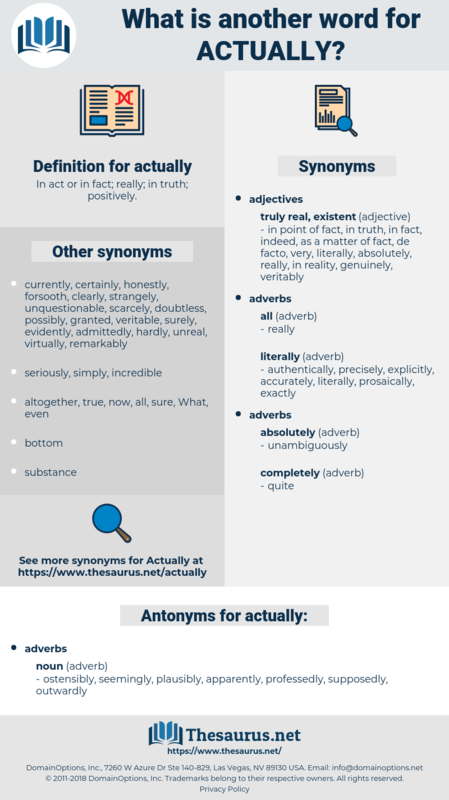 truly, exactly, virtually, certainly, essentially, basically, practically, realistically, absolutely, ultimately, definitely, rather, truthfully, specifically, precisely, fundamentally, actuaily, substantially, incidentally, even, meaningfully, fact, totally, actively, concretely, honestly, sincerely, frankly, completely, properly, instead, literally, simply, indeed, physically, seriously, Substantively, surely, admittedly, originally, finally, materially, clearly, presently, surprisingly, namely, fully, just, accurately, eventually, conscientiously, strictly, obviously, intrinsically, tangibly, best, better, correctly, effectively, particularly, earnestly, unexpectedly, significantly, truth, successfully, functionally, personally, yes, objectively, almost, utterly, operationally, extremely, naturally, entirely, efficiently, however, directly, explicitly, downright, fairly, anyway, terribly, rightly, still, already, apparently, typically, also, nevertheless, lastly, now, verily, thoroughly, generally, positively, probably, necessarily, usually, desperately, empirically, adequately, furthermore, appropriately, officially. ostensibly, seemingly, plausibly, apparently, professedly, supposedly, outwardly. She actually tried to keep the Count from going back to the Club. Then, she was actually coming in at the door! acquittal, actual, a good deal, acetyl, acetal, astutely, acaudal, asystole, acutely.